Approximately 5 GW of new renewables were added across nonmetropolitan areas of 12 Midwest states between 2016 and 2017, compared to about 1.7 GW of capacity added in urban areas, according to the report. 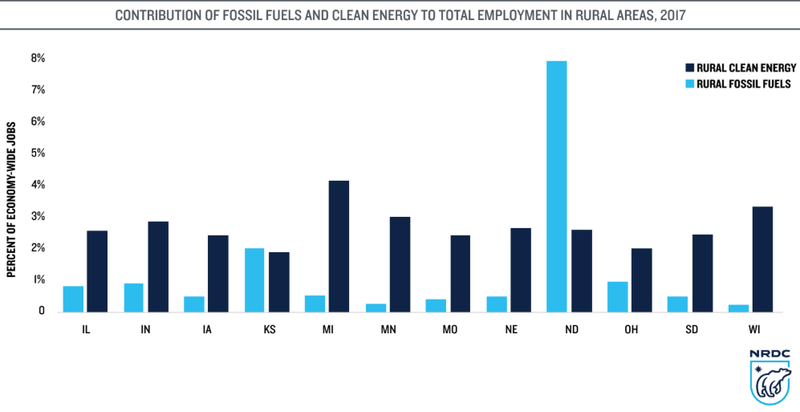 NRDC’s analysis focused on Illinois, Indiana, Iowa, Kansas, Michigan, Minnesota, Missouri, Nebraska, North Dakota, Ohio, South Dakota and Wisconsin. Development in the region is not slowing down either. Last week Capital Dynamics announced an agreement with power company Tenaska to develop 2,000 MW of solar across half the states listed in the report. And Illinois has 600 MW under construction with another 1.2 GW planned, which will more than double the state’s current rural renewables capacity of 1.6 GW. An example of a public power utility attracting a data center can be found with the Omaha Public Power District. Facebook in 2017 said that it had selected a new Nebraska wind project that will supply power to the social media company’s new data center in Papillion, Neb. OPPD played a key role in bringing the data center to Nebraska through an innovative rate plan. This entry was posted in Nebraska / Midwest News and tagged Capital Dynamics, economic benefits of renewable energy development, Natural Resources Defense Countil (NRDC), Nebraskans for Solar NewsBlog, Omaha-based Tanaska Energy, OPPD, renewable energy development in the Midwest, rural renewables development, Utility Dive on December 10, 2018 by Helen Deffenbacher. A new plant in Creighton University’s budding energy garden has taken root. On a recent Saturday afternoon, as part of the culmination of their coursework, students in Creighton’s Energy 131 course – part of the university’s Energy Technology Program within its College of Arts and Sciences, focused on installing and maintaining photovoltaic systems – erected the campus’ second EnergiPlant USB charging station between the Mike and Josie Harper Center and Davis Square. Click to continue reading. 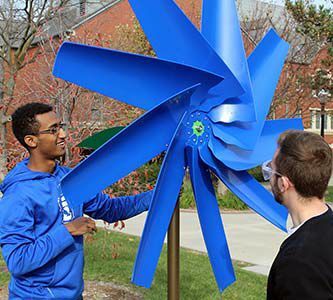 Creighton University Photo: The EnergiPlant – the second on Creighton’s campus – resembles a roughly 12-foot tall metal flower with a bloom doubling as a wind turbine and four metal leaves embedded with solar panels, all producing about 300 watts of power. South Dakota to get its first utility-scale solar project, PV Magazine. 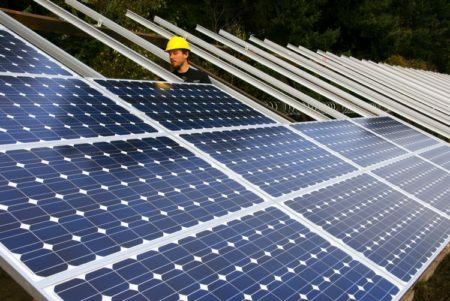 The SD Sun project will expand the installed capacity of one of the last states to deploy large-scale solar by more than 100x. 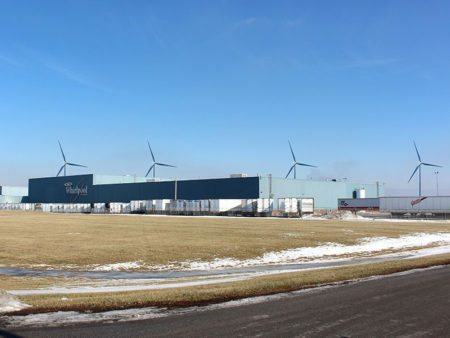 Report: Illinois leads on clean energy but could make it better, PV Magazine. The Environmental Law & Policy Center says Illinois is well on its way to building a strong clean-energy infrastructure and offers its suggestions on how to enhance its region-leading work. This entry was posted in Nebraska / Midwest News, NewsBlog and tagged Creighton University, Creighton University's Energy Technology Program, Public Utility Regulatory Policy Act (PURPA), renewable energy development in the Midwest, renewable energy news on November 22, 2017 by Helen Deffenbacher. Add it to the list – another city has made a 100 percent renewable energy pledge. On Friday, the St. Louis Board of Aldermen passed a measure to power the city entirely on renewables by 2035. In doing so, St. Louis became the 47th city – and the largest in the Midwest so far – to make a 100 percent clean energy commitment. Other major cities to announce 100 percent commitments include Atlanta, San Diego, Salt Lake City, and Chicago. Some cities – such as Aspen, Colorado; Burlington, Vermont; and Georgetown, Texas – have already hit their targets. The company says the $307 million is the largest solar loan securitization issued to date and that this will not be its last. The latest bundling of solar leases and PPAs by the company that pioneered the practice is not small one. Google uses more electricity than the city of San Francisco and its energy demands are growing by 20 percent a year. The tech giant is aiming to be completely powered by renewables in 2017, and wants Asian policymakers to make it easier for companies to buy clean energy. This entry was posted in Nebraska / Midwest News, NewsBlog and tagged renewable energy development in the Midwest, renewable energy news, St. Louis commits to 100% renewables, U.S. renewable energy development, U.S. renewable energy investments on November 1, 2017 by Helen Deffenbacher. For nearly a decade, landowners in western Saline County have tried to bring energy developers into the county to build a wind farm. On Aug. 17, those plans finally came to fruition when Aksamit Energy Development broke ground on a 74-megawatt wind farm that will cover 21 square miles of western Saline County south of Friend. Milligan 3 will be the company’s first completed and operational project. Milligan 3 will connect to a 115 KV line at the Friend, Nebraska substation. The project will produce enough energy to power 30,000 homes. Aksamit Energy Development is a a wholly-owned Aksamit Resource Management subsidiary. This entry was posted in Nebraska / Midwest News, NewsBlog and tagged Aksamit Energy Development (AED), Aksamit Resource Management, Milligan 3 Wind Farm, renewable energy development in the Midwest, wind energy development in Nebraska on August 23, 2017 by Helen Deffenbacher. Seven Sioux tribes in the Dakotas are developing what would be an enormous collection of wind farms on six reservations scattered across what is generally rated as one of the windiest areas in the country . . . “We do need the jobs and revenue that this project would create, and it also coincides with our culture in taking care of the earth and climate. To us, the wind is sacred. 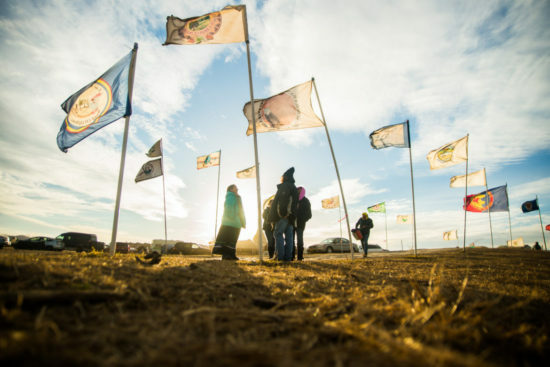 Also, it’s giving us a chance to do our part in reducing the carbon footprint, and to help slow down climate change.” – Lyle Jack, who represents the Oglala Sioux Tribe on the Oceti Sakowin Power Authority, an entity the tribes formed four years ago that is pursuing the wind projects. Read more. This entry was posted in Nebraska / Midwest News, NewsBlog and tagged Karen Uhlenhuth, Midwest Energy News, Nebraskans for Solar.Org, Oceti Sakowin Power Authority, renewable energy deployment = economic development, renewable energy development in the Midwest on December 1, 2016 by Helen Deffenbacher. American companies are increasingly making their own power — and sales — with wind turbines located near the factories and buildings that consume the power they make, concludes a report released today. The 2015 Distributed Wind Market Report offers the fourth annual analysis of a growing field called distributed wind, which involves generating wind power near where it will be used instead of purchasing power from large, centralized wind farms. Distributed wind can range from a small, solitary turbine at a remote cabin to several large turbines powering an entire neighborhood. “Wind plays a key role in the rising area of distributed energy,” said report co-author, Alice Orrell, an energy analyst at the Department of Energy’s Pacific Northwest National Laboratory. “Although distributed wind is not as widespread as distributed solar, new third-party financing options similar to the lease model that spurred growth in the residential solar market could also grow distributed wind,” added PNNL energy analyst Nik Foster, the other co-author. 37 percent of the new distributed wind capacity added in 2015 was for industrial uses, including factories, processing plants, and operation facilities. Companies using distributed wind include the Whirlpool and Ball corporations in Ohio, soap manufacturer Method in Illinois, and Stafford County Flour Mills in Kansas. Exports of U.S.-made small wind turbines, which generate up to 100 kilowatts, doubled from 2014 to 2015 — adding 21.5 megawatts of capacity in 2015. Small wind exports have accounted for more than $310 million in combined sales between 2012 and 2015. Italy, the United Kingdom and Japan are among the largest importers of U.S.-made small wind turbines. 28 megawatts of new U.S. distributed wind power capacity was added in 2015 by installing 1,713 turbines. This brings the U.S. to a total of 934 megawatts of distributed wind capacity and 75,000 turbines installed since 2003, or about 1 percent of all U.S. wind energy capacity installed since then. Ohio, Nebraska and Connecticut led the U.S. in new distributed wind power capacity in 2015 — respectively adding 7.7, 7 and 5 megawatts, due to a large project in each of those states. The estimated cost of energy made from a sample of small distributed wind turbines was 11 cents per kilowatt hour in 2015, compared to overall residential electric rates that run between about 9 and 21 cents in the Continental U.S. Annual distributed wind capacity additions have declined since 2012, when federal stimulus funding spurred renewable energy’s expansion. More information can be found in the full report and in DOE’s announcement. This entry was posted in Nebraska / Midwest News, NewsBlog and tagged Corporate Renewable Energy Buyers' Principles, EIN News, renewable energy development in the Midwest on August 17, 2016 by Helen Deffenbacher. 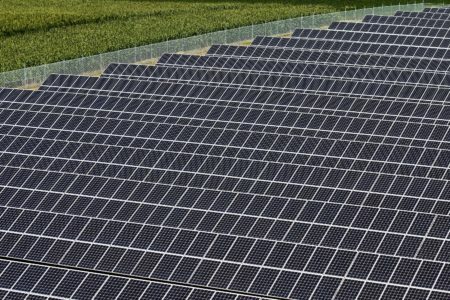 E. Shaw Renewable Investments announced that it has acquired the 100MW North Star PV project from Community Energy and has started construction on the installation, which is located in Chisago County, Minnesota . . . Once completed in late 2016, the North Star project is expected to be the largest solar installation in the Midwest and one of the biggest sites in the US. North Star will be constructed on private agricultural land and has a 25-year power purchase agreement with Xcel Energy. Read more. Minnesota regulators have given EDF Renewable Energy a two-year extension to build the 105MW Stoneray wind farm. This entry was posted in Nebraska / Midwest News, NewsBlog and tagged Minnesota's renewable energy projects, PVTech, renewable energy development in the Midwest, ReNews on July 15, 2016 by Helen Deffenbacher. 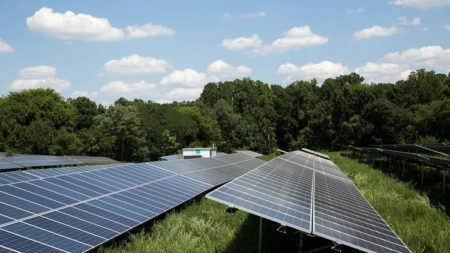 A solar energy system planned for installation next year in Dubuque would be the largest project of its kind in any Iowa city, potentially providing a blueprint for solar’s growth across the state. Alliant Energy plans to install solar panels at two sites covering 32 acres in Dubuque to form the largest solar system created by the utility, said Zachary Hill, senior manager of business development. Hill said construction likely will begin in the spring and should be completed by late summer. Continue reading. 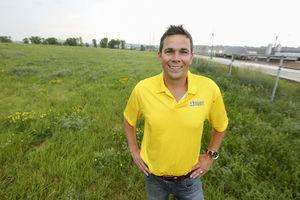 Photo by Nicki Kohl: Zachary Hill, senior manager of business development for Alliant Energy, stands at the future solar array site on East 12th Street near Dubuque’s 16th Street Detention Basin. The contract with Geronimo Energy involves investing in 5 megawatts of solar power production at community solar gardens in and near Mankato. The deal costs the city nothing upfront and guarantees a 1 cent per kilowatt/hour discount on that amount of power purchased from Xcel Energy for the next quarter-century. The city’s power rate currently ranges from 9 to 10 cents per kilowatt/hour. Read more. This entry was posted in Nebraska / Midwest News, NewsBlog and tagged Mankato Free Press, Nebraskans for Solar, renewable energy development in the Midwest, TH Media on June 15, 2016 by Helen Deffenbacher.